In the past several months I've designed and had fabbed several different PCBs for three separate projects. I also happened to use three different PCB fab houses for each project, for reasons I'll describe below. I decided it might be worth going into a mini review for comparison of the three. I've got no better order than when I happened to use them, chronologically, so first up is OSH Park. This board was for my nesRF project. It's not a wonderful example (very simple, especially for the size), but I still had two unused ones which were easy to scan side-by-side. I had specifically selected OSH Park for this project because part of it involved designing pads for conductive rubber pill buttons. OSH Park is a slightly more premium shop, they include ENIG (gold plating) by default in their base price, and I figured that could be valuable for the high physical stress those pads might be exposed to. I stuck with them for the four different boards in the project. The feature and cost balance is OSH Park's high point in my opinion. They charge purely by the square inch, which is great for small (e.g. many hobbyist) boards. I re-spun the smallest board in this project to add an external crystal for the AVR, and it only cost me $4 and change to do so, including shipping. They're also in the USA, which is generally nice (if you are as well), plus helps with the shipping times. OSH Park's primary downside for me is that they're a panelizing service, and what you're left with is arbitrarily positioned mousebite connectors, half still hanging to your board (as you can see above). I got really unlucky with one board from them, they happened to leave that rough edge in a spot I really needed to be flat as designed, so I got to very carefully Dremel it back down to flat. There's also the purple board issue. It's a nice premium/unusual color, but you get no choice in the matter. Because they panelize, everyone gets the same options: 1.6mm, purple, ENIG. Period. Finally, you always get a multiple of three from them. This can be good or bad depending, but is fewer than the other two suppliers I'll get into, so you're paying for less wastage if you don't need many copies. Overall I consider them to be premium quality, but still very affordable. 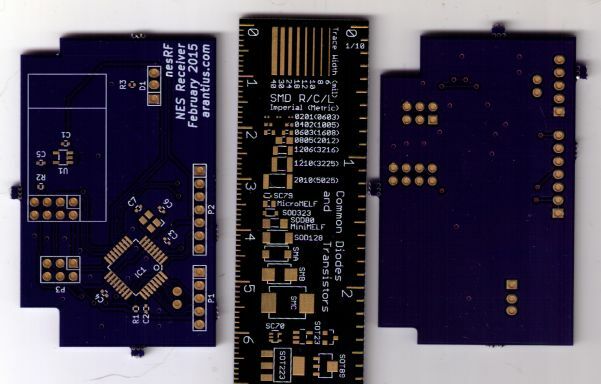 Next up is a little board I had made at DirtyPCBs. I had learned of their existence only shortly before starting this project and was interested in giving them a shot. 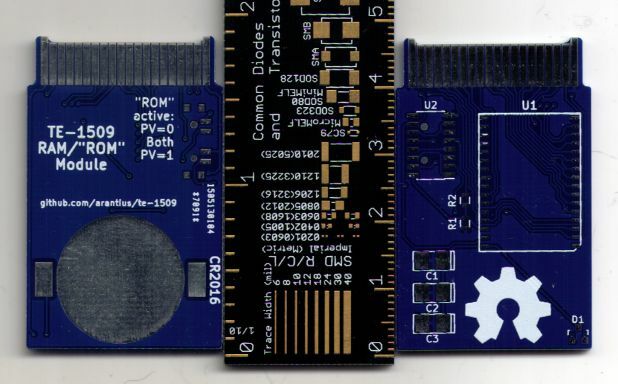 For this one, I absolutely had to have a 1.0mm thick board, and I knew DirtyPCBs could do that. These PCBs are indeed "dirty" though. Their "protopack" option (the cheapest, which I selected) gives you about ten copies, which was far more than I needed. Several of them had scuffs and scrapes when they arrived, but these were just cosmetic issues. The picture isn't fine enough to show it, but in person I can clearly see fine marks on every pad: evidence of flying-lead electrical testing. I like that I know it was done; this must be where the "about ten" number comes in. Unlike OSH Park, these boards are made individually, so you get choice of finish, color, and thickness. They're also individually routed, which is great. Mine came with an obvious little bit of flash left, consistently in the same spot. A little nub a quarter of the way down one of the long sides. Dirty. But also very affordable. Finally we've got my latest project, these boards just arrived today. This one is what made me decide to put this review together. I learned about PCB Shopper between this project and the last. A wonderful service that allows you to input your parameters, and automatically compare providers capable of those parameters, by price. That's how I selected Elecrow to fab these boards. They're exactly 5x15cm, which fits right into the sort of size range that some services base their prices on. 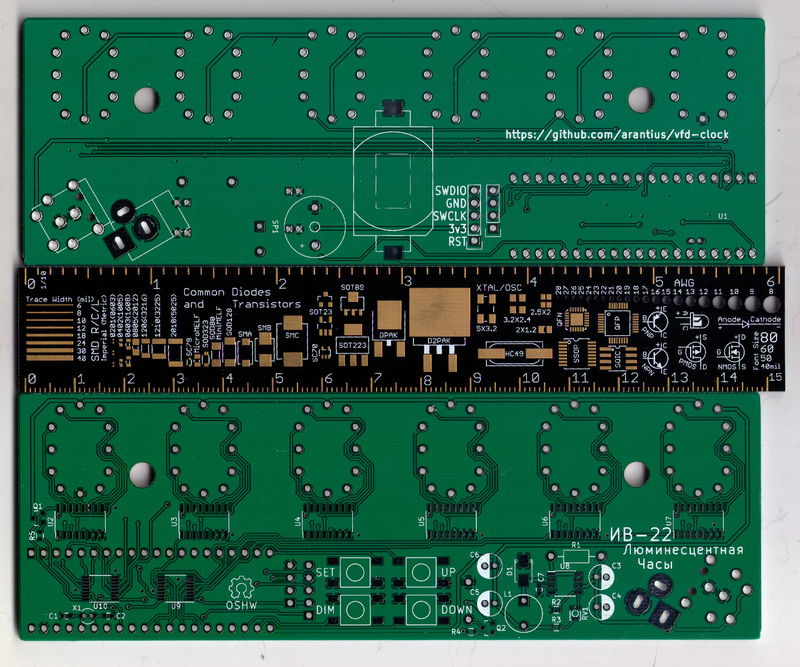 One thing I have to mention up front which made me very happy with Elecrow: I left a design mistake in this board. I custom built the footprint for the display tubes, and I clicked a box wrong, neglecting to pull the solder mask back from the bottom layer. They noticed this, produced an image pointing it out, and asked me if it was intentional. It was not, I fixed it and sent them an updated design, and they produced that instead. Saving me either a lot of hassle trying to solder those connections, or time and money re-spinning the boards. I was very impressed. As for the boards themselves, it's the first where I really pushed any boundaries. 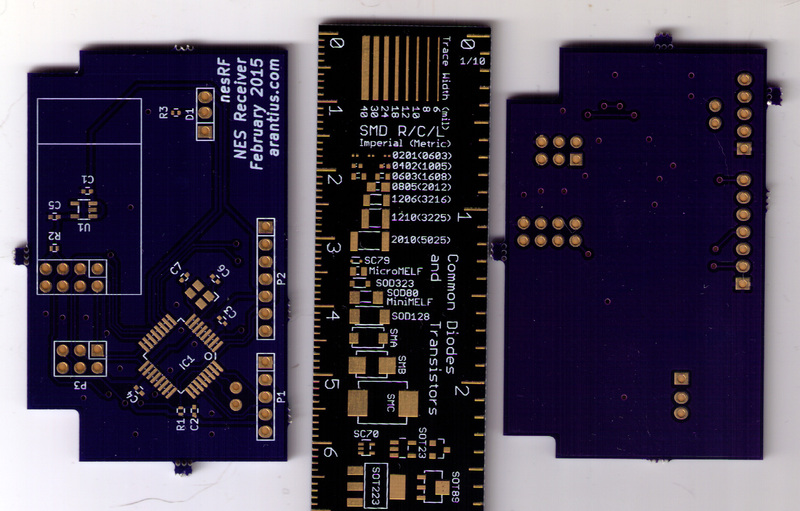 The previous projects I mostly used KiCAD's default settings, picking tolerances and clearances that I knew to be well within all fabs' abilities. In this case though, I desperately wanted to squeeze in the data bus which spans the bottom layer (which is on the top of this image) into the spot it is there: down the middle of the chips. 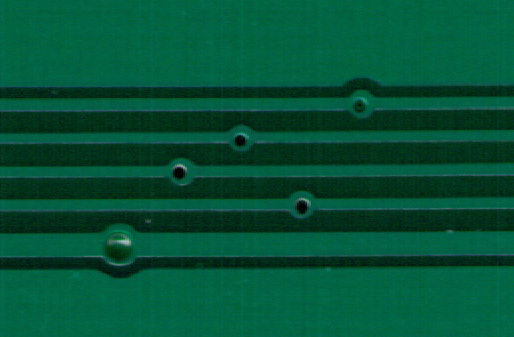 I had to create tiny vias, only 12 mil (thousandth of an inch) diameter holes, drilled into pads only 20 mil diameter. The second picture shows a detail view of a cluster of these vias, which is right down at the minimum tolerances Elecrow claims to support. 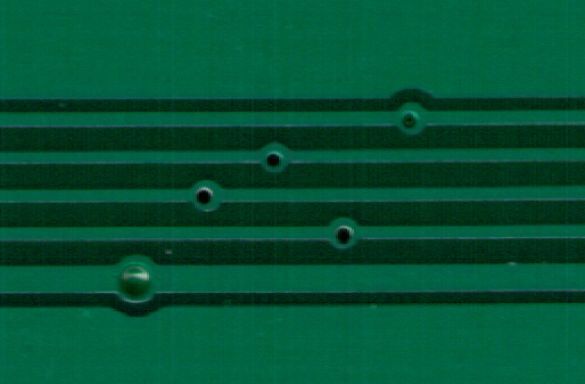 (This compared to the default size vias, the one in the lower left of this detail picture, at 25 mil holes in 35 mil pads.) I've only electrically tested one board, but it's got all of these 24 data pins connected together correctly. There's also plated slots in the power connector, and non-plated mechanical holes. Both of these are a bit rare and/or added expense, and they're done correctly as specified. For this size Elecrow was also the cheapest provider I could find, which makes me very happy with this array of features and customer support. Unfortunately I don't have specific times from order to receipt of these boards anymore, so I can't compare complete delivery time. This would be unfair anyway, as I selected different options. My email records show that the OSH Park order was placed on April 17th, with shipment notification on the 28th, or an 11 day/7 business day turnaround. DirtyPCBs' email records show order to shipment notification of May 11th to 17th, or seven days/five business days. Finally Elecrow was July 25th to the 31st, or the same seven days/five business days. (And I already have the boards now because I sprung for the "2-3 day DHL" shipping option this time). Minimum Via size pt 2? That elecrow page says "Q: What is the minimum recommended annular ring size for your 2 layer (color free) service?" (Emphasis mine.) I exceeded their recommendations a bit, in the ring size. It happens to have worked out for me. I've seen noticeable differences, when you get down to tolerances this small, in cheap-from-China boards. Maybe at least one board of a batch of ten will be OK if you're relying heavily on pushing the tolerances like this. Maybe it's worth paying a few extra bucks.